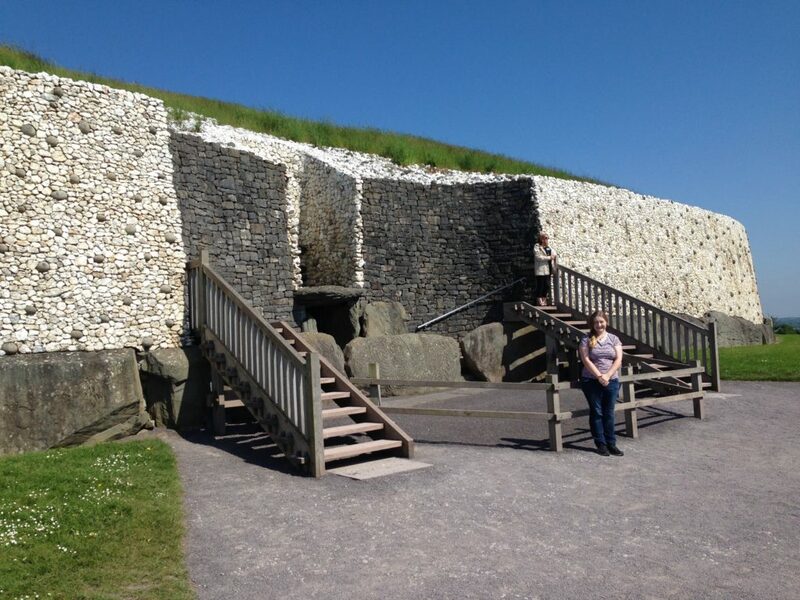 While in Ireland we got to see two UNESCO World Heritage Sites: Newgrange (in the Republic, and a “cultural” site), and the Giant’s Causeway (in the North, and a “natural” site). I would have loved to have seen the third, Skellig Michael in Co. Kerry, but access is strictly limited and entails a boat ride across an often choppy sea, and a perilous climb up steep and slippery steps – not ideal for a tour group of 35! 1. Newgrange is the largest monumental structure at Brú na Bóinne (“Palace of the Boyne”), a complex of tombs, stone circles, and other manmade features just north of the River Boyne in County Meath, north of Dublin. Drogheda (the site of a frightful Cromwellian massacre in 1649, and also the site of the famous Battle of the Boyne in 1690) is about ten kilometers to the east of Brú na Bóinne, but we were there to see something much older: a neolithic passage tomb dating from c. 3200 BC, and thus predating Stonehenge and the Giza pyramids. From the outside, it’s really just a large earthen mound, with a retaining wall on the front made up of white quartz cobblestones. This wall is the work of one Michael O’Kelly, the main twentieth-century archaeologist for the site and is based on his “best guess” of what it might have looked like in the neolithic. Needless to say, this feature is somewhat controversial. Things get really interesting, however, when you enter the doorway shown above. You squeeze down a dry stone passageway for about twenty meters, and arrive in a corbeled interior chamber with three side “chapels,” each with its own stone “altar” (designated a basin). The guide claimed that this passageway is original and was never reconstructed – in fact, the entrance was covered and hidden until AD 1699, when a local landowner found it and brought it to the attention of antiquarians. No photography was allowed inside, so I scan some illustrations. 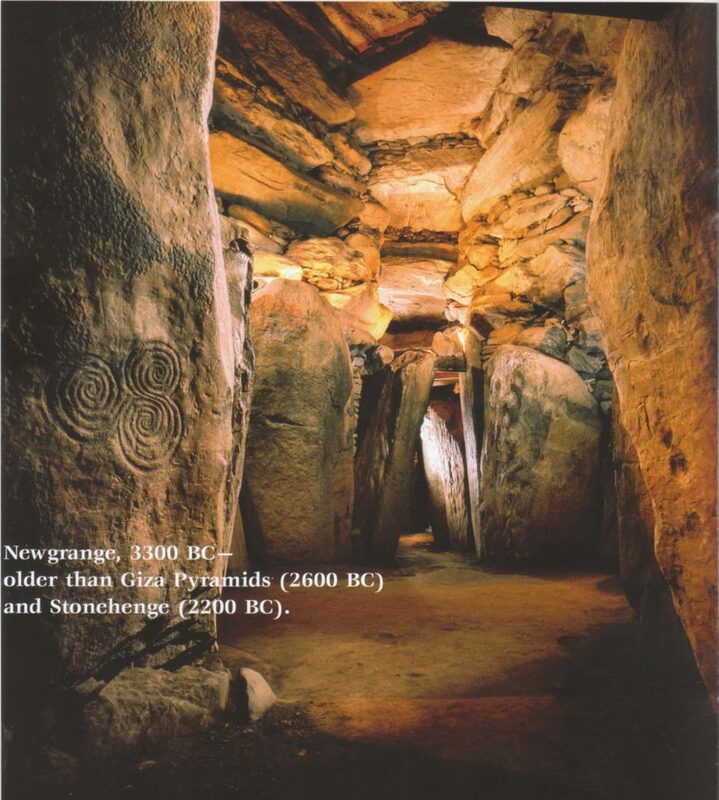 From George Eogan and Peigin Doyle, Guide to the Passage Tombs at Brú na Bóinne (2010), 2. This is a view from the interior chamber looking back towards the entrance. The spiral motif is common at the site, but what it actually means is anyone’s guess. From George Eogan and Peigin Doyle, Guide to the Passage Tombs at Brú na Bóinne (2010), 17. This is a view of the right-hand side chapel, with basin stone. Apparently cremated human remains were discovered on these stones, but the cremations did not take place in the chamber itself. This has given rise to the theory that bodies were cremated outside, and the remains brought into the chamber for a special ceremony, most likely at the Winter Solstice, then taken out and interred elsewhere (plenty of smaller burial tombs have been found at Brú na Bóinne). Why the Winter Solstice? Because that’s when sunlight penetrates to the interior. Here is another view of the entrance – note the “roofbox” over the door. 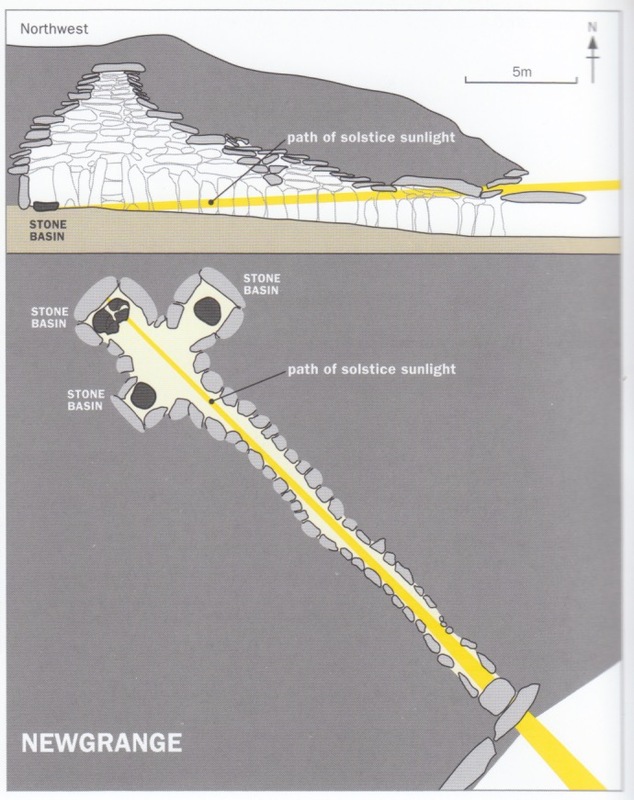 From George Eogan and Peigin Doyle, Guide to the Passage Tombs at Brú na Bóinne (2010), 20. And here is how it works: note the upward slope of the passageway, which blocks out light from the doorway, and allows only the shaft of light from the roofbox to reach the central basin stone. The slight zigzag of the passageway also ensures that the light is focussed by the time it gets to the interior. Our guide turned out the lights in the interior chamber and then lit one that simulated the solstice effect, but she said that it was a poor substitute for the real thing. But to experience this, you have to apply for it. The sunlight gets in for a few minutes a day over a period of about five days, roughly Dec. 19-23. 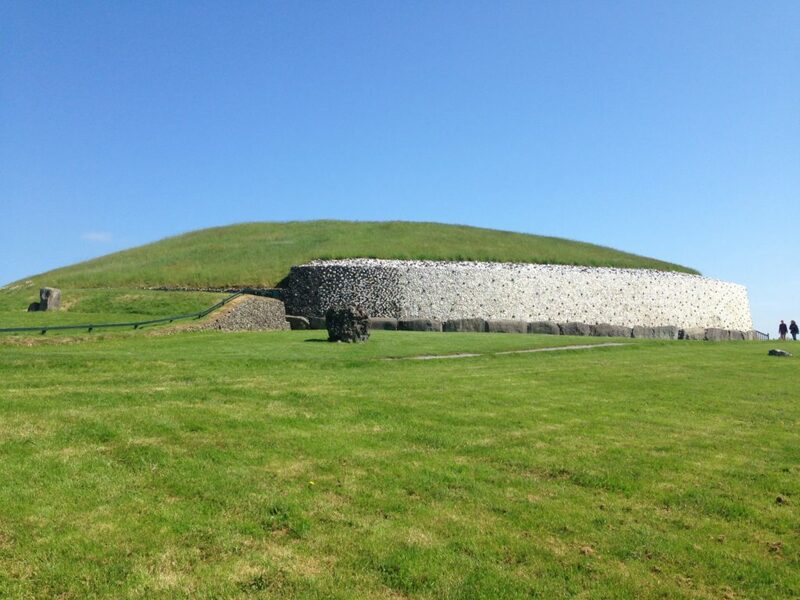 They let ten people in per day, and you can bring a friend, meaning that 100 people can experience the Winter Solstice at Newgrange every year. The trouble is that some 32000 people apply! So the odds really aren’t in your favor, although they have started live streaming it over the Internet. Brú na Bóinne is by no means the only such neolithic site in Europe. All along the west coast, from Spain to Scandinavia, one finds the remains of these monumental structures, usually circular and astronomically aligned, indicating surplus wealth generated by agriculture, political organization to order them constructed, and far-flung communication networks to spread knowledge of building techniques, and trade networks to import construction materials (Brú na Bóinne contains material from as far south as the Wicklow Mountains, and as far north as Slieve Croob in County Down). Alas, they are definitely prehistoric, in that nothing resembling a script has ever been discovered at any of them, so much of our knowledge of this period must remain speculative. 2. The Giant’s Causeway is a volcanic formation of about 40,000 interlocking basalt columns on the north coast of Northern Ireland. Similar sorts of formations may be seen elsewhere on the Earth (the one I’m most familiar with is Devil’s Tower in Wyoming), but they are rare and distinctive enough to be intensely captivating. 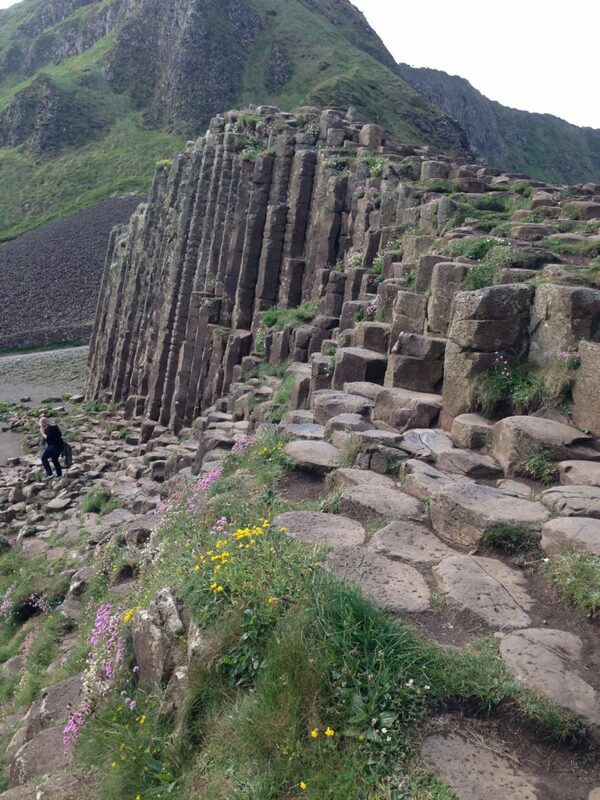 The standard theory is that the columns were created some sixty million years ago, when a large and thick lava flow cooled very slowly and, due to the chemistry of the basalt, formed regular polygonal columns. These were hidden deep underground, as the top layer of the basalt, exposed to the air, cooled much more rapidly and thus did not develop the distinctive pattern. Successive Ice Ages, however, stripped away those top layers, revealing the basalt columns and creating what, to a human, is a bizarre, ethereal sight. Finn McCool was a giant who, for the most part, lived a quiet life with his family here on the Northern Irish coast. 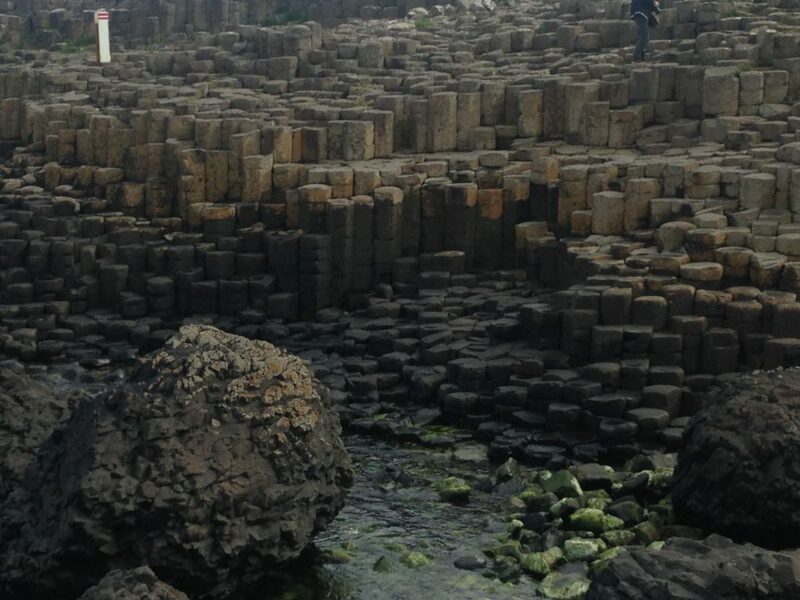 But there were rivals, other giants, and perhaps to pre-empt a challenge from his Scottish neighbour, Benandonner, Finn laid down the gauntlet and then built the Giant’s Causeway so they could meet and do battle. However, on his way over to Scotland, Finn spied Benandonner in the distance and realised that his rival was much bigger, taller and stronger than he had appeared from across the water. Finn decided he didn’t want to fight Benandonner any more and ran back home as fast as he could – so fast that he lost his boot on the shore. Finn found his wife Oonagh and explained the terrible mistake he had made. Oonagh, being the brains of the pair, devised the plan of dressing up Finn as a baby and putting him into their son Oisin’s cot, covering him with blankets and wrapping a shawl around his head. When Benandonner saw the giant baby in the cot he got scared. He thought, if that’s the size of the baby, how big is the father? 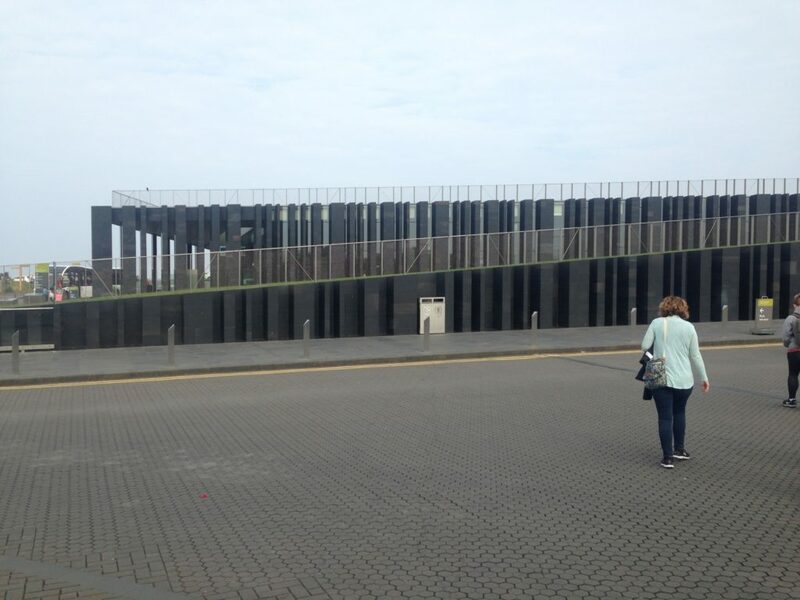 The current visitors’ center, which opened in 2012, is architecturally very well done (more at dezeen – check it out). 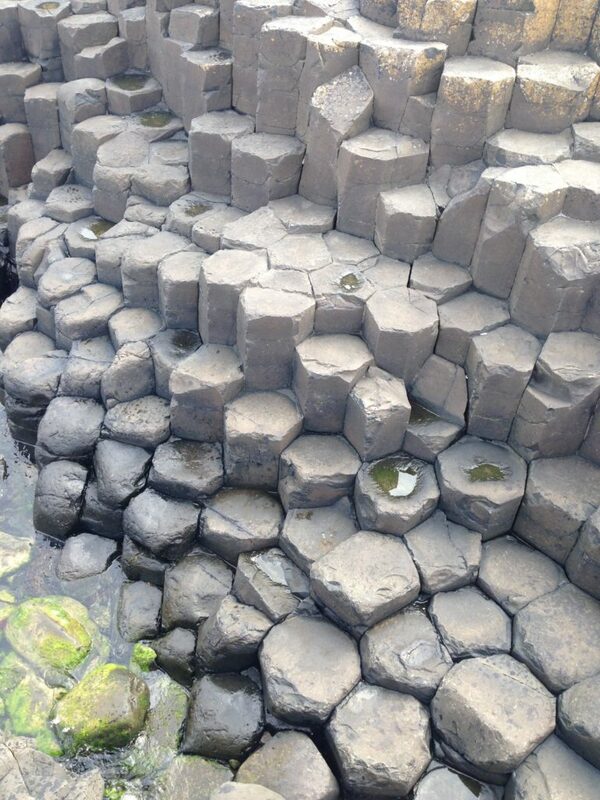 It lies unobtrusively low to the ground, but its walls reflect the Causeway’s geological formation. 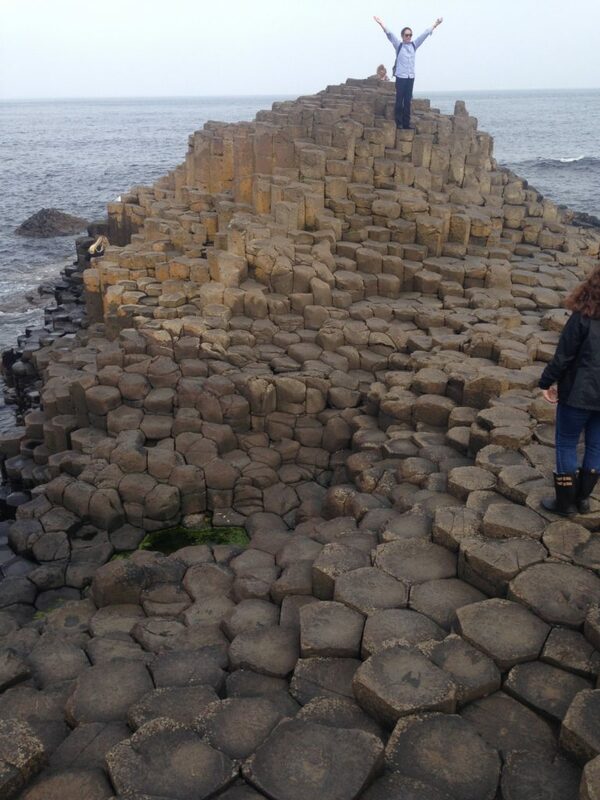 After our visit I kept seeing references to the Giant’s Causeway all over the place, and it seems to me it’s a symbol of Northern Ireland. 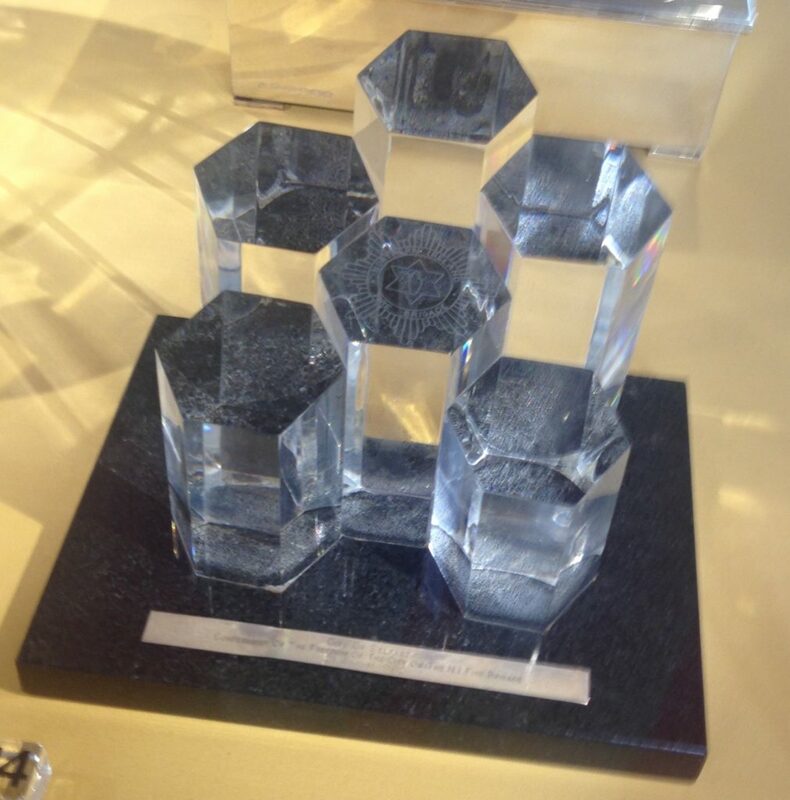 This is a memento on display in the Belfast City Hall Museum. A bonus is that the six-sided columns (and in this case, six columns) can refer to the six counties of Northern Ireland. 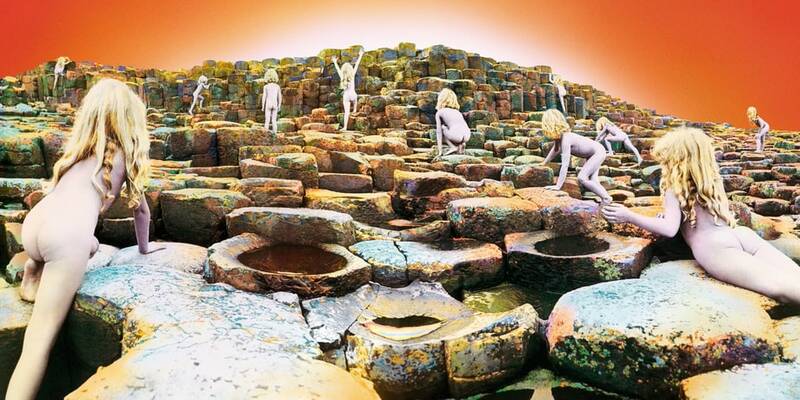 I never made this connection, but the Giant’s Causeway is the setting for the cover of Led Zeppelin’s fifth studio album Houses of the Holy (1973). I loved this record in high school! Where’s that confounded bridge? 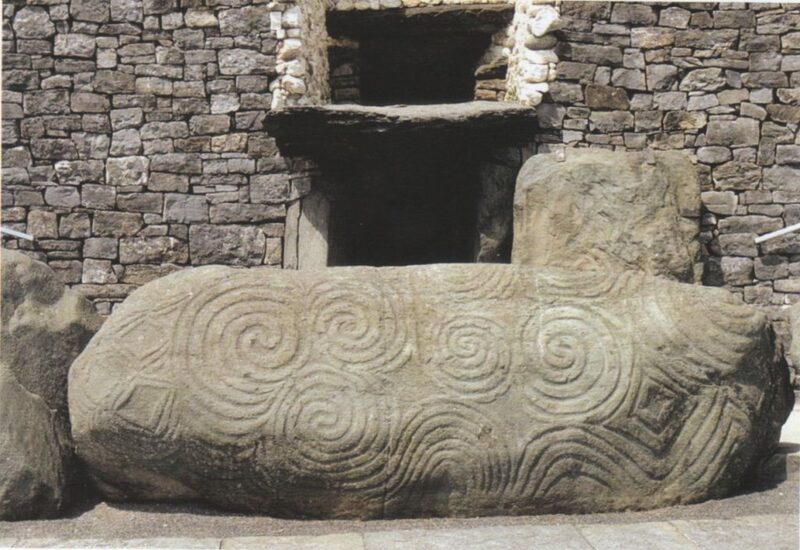 This entry was posted in Architecture, Geology, Ireland, Myths and Legends, Neolithic, Travels by jgood. Bookmark the permalink.